The Pad Group loves to represent unique homes. Every now and then we're lucky enough to find a House that truly says "You're Home" the moment you walk through the door. We have a new listing in Bedford, Texas. It's a beautiful 4 bedrooms, 2.5 baths, Game room and media room floor plan with lots of open space. Most importantly this home looks like a magazine. Jenna Stromberg is the owner and the mastermind behind the artistic touches that have made this home something really special. The moment you walk through the door you see beautiful vignettes with special messages welcoming you into her home. The high ceilings bring your eyes straight up to the second story loft. Walking into the living room you are drawn to the stunning fireplace and beamed ceiling. Jenna's choice of artwork and furniture make this room so warm and inviting. Real Estate Questions Asked by Home Buyers and Sellers—Answered! 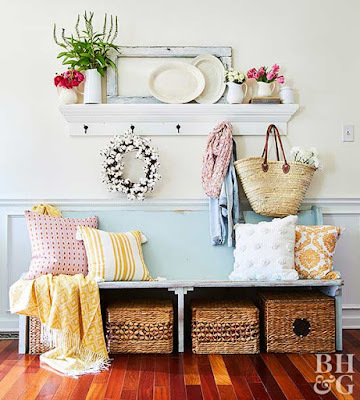 A Blogger's Cottage Dream Home ` A mom of three taps her creative side to get a vintage look on a tight budget.